FROM THE BANK OF THE WEST CLASSIC: The defending champion Serena Williams pulled out of the Bank of the West Classic Stanford last week, which is too bad, but there are other people who need to catch fire on the hard courts in the next four weeks. Soon, the US Open will begin and we all know that Serena is a heavy favorite to win a major against, given that she had won four Slams in a row. No one is playing well enough to knock off the 21 Grand Slam champion. It can occur, but if Serena is playing extremely well, it is hard to figure out how you can attack her. She has a phenomenal first serve. She has a bullet of a forehand and backhand. Her returns are laser like, and she is very smart and wise. Essentially, no one can toppled Williams. But as Aga Radwanska said the other day, Serena is almost untouchable, but on occasion, she can drop a bit, she is a little off and then someone while have slight chance to stun Serena. There are plenty of fine players at Stanford, but every single one has to become better if they ever want a real shot to upend Williams. The top seed at the Bank of the West is Carolina Wozniacki, who is a close friend with Serena and she cheers for her when Williams wins, but at the US Open, Wozniacki wants to win a title – a very big title. As the former No. 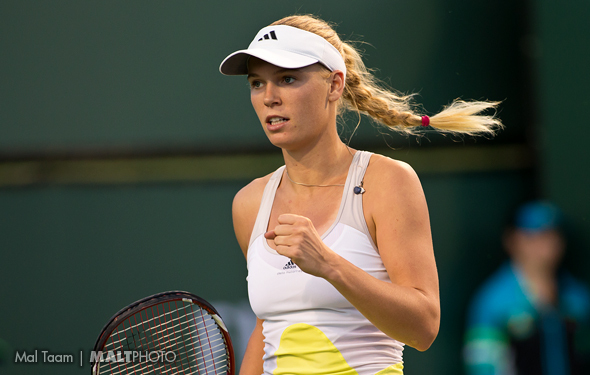 1 Wozniacki said, at the end of this year, she would be the happiest if she snares the US Open. Last year, ‘Caro’ played very well in reaching the final in NYC, but then Serena whacked her. At the WTA Final in the semis, Wozniacki played as well as she could and she was so close to out-run Williams, but she backed off a little bit, Serena stepped up and Wozniacki went down. This year, the Dane has been up and down. At times, the No. 5 has been very up and down. She should have won at Stuttgart, beating Lucie Safarova, Carla Suarez and Simons Halep. But in the final, she was playing against Angie Kerber, she was ahead in the third set, but then she fell. She was nervous and if she is going to rise again, she has to find a way to win to believe in herself at crunch time. On Thursday, she will have to face the tough veteran Varvara Lepchenko. If she out hits her, she will have to play Mona Bathel, a big hitter. If she wins there, she will have to play the likes of the new No. 10 Katerina Pliskova or maybe the rising youngster Madison Keys. Then Wozniacki will know that if she can out-stroke the up-and-comers, she has to be aggressive, because Stanford ‘s courts are fairly fast and you cannot just push the balls back in and hope. On the other side of the draw, the 44-year-old Kimiko Date-Krumm was down 4-1 in the second set and came back to stun Sabine Lisicki 1-6 7-6 (4) 6-2. Props to Date-Krumm for winning, who entered the tournament ranked No. 174, but what is Lisicki doing? She is so unpredictable… The Ukrainians went at each other between with the young Elina Svitolina overcame the new mom Kateryna Bondarenko 4-6 6-4 7-5. Svitolina has been extremely well this season and will face Alison Riske, who upended Carlos Suarez in the second round. Riske is changing around and she needs to play much more confident for the rest of the year because before that, she was confused. Angelique Kerber will go up again the Croatian Ana Konjuh, who will be heard from very soon.